Widely regarded as one of the literary world's most accessible poets, neophytes and die-hard fans alike will relish this definitive collection of the late Nobel Prize winner's work. Flip to any page and you'll be convinced this is a necessary volume for any bookshelf. Revelatory but rooted in commonplace. One of Europe’s greatest poets is also its wisest, wittiest, and most accessible. Nobel Prize winner Wisława Szymborska draws us in with her unexpected, unassuming humor. “If you want the world in a nutshell,” a Polish critic remarked, “try Szymborska.” But the world held in these lapidary poems is larger than the one we thought we knew. ​Edited by her longtime, award-winning translator, Clare Cavanagh, Map traces Szymborska’s work until her death in 2012. Of the approximately two hundred fifty poems included here, nearly forty are newly translated; thirteen represent the entirety of the poet’s last Polish collection, Enough, never before published in English. 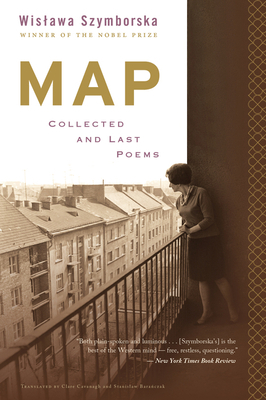 Map offers Szymborska’s devoted readers a welcome return to her “ironic elegance” (TheNew Yorker).